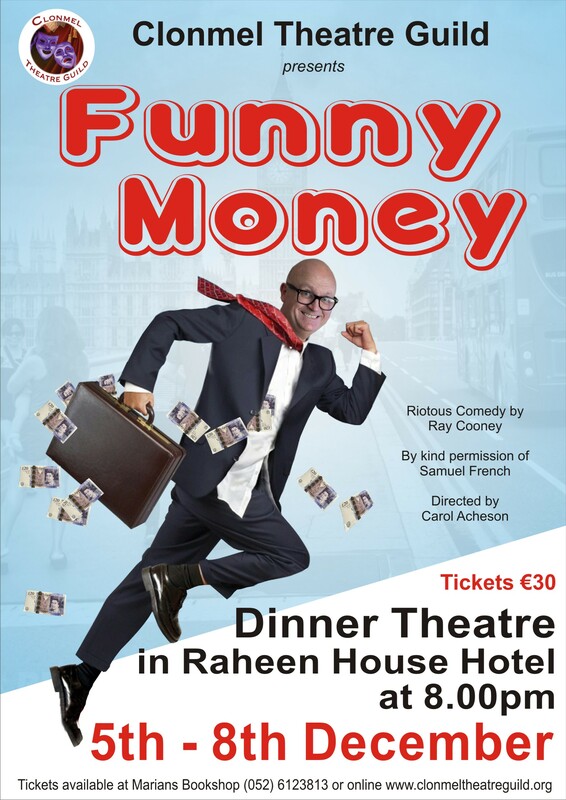 Clonmel Theatre Guild returns to Raheen House Hotel for its Christmas Dinner Theatre production of Ray Cooney’s hilarious farce “Funny Money”. Directed by Carol Acheson, this production takes to the stage from 5th to 8th December 2017. 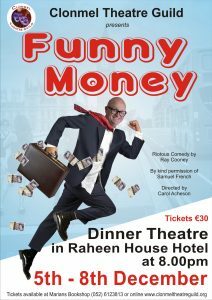 Funny Money is the classic stage farce with lots of doors and general confusion and chaos giving the audience a comic spectacle.! Henry Perkins, a mild-mannered accountant, accidently picks up the wrong briefcase one full of money. Henry assumes it is illicit cash and he decides to keep it. Knowing that the former owner must have his briefcase, he rushes home to book one-way fares to Barcelona. He tells his confused wife to leave everything behind. The doorbell rings and a police detective is at the door. Henry’s inept attempts to extricate himself from this situation lead to increasingly hysterical situations. Tickets costing €30 are on sale in Marian’s Bookshop and online on this website. This is an ideal opportunity to have a Christmas night out with a difference. We encourage you to book your tickets early as it is sure to be a sell-out. A donation from the raffle each night will be made to CARE Cancer Support Centre, Clonmel.